A new deal between the city and the Concord Pacific development corporation might further change the social geography of Vancouver. 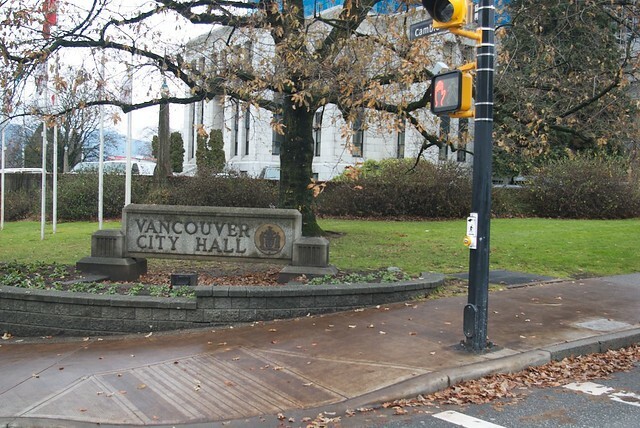 The deal would grant the City two properties along East Hastings that will supposedly be designated for desperately needed 100% social housing. The first site is 117 West Hastings, next to Insite. After buying the property specifically for the purposes of speculation and horse-trading, Concord put a “community garden” on it to avoid paying property taxes. The second site is the empty lot at 58 West Hastings, which hosted 2010’s Olympic Tent Village. Concord also bought this land for the purposes of speculation and horse-trading. They claimed to have had plans to put 160 condo units on the lot, but for over two years have also been working behind the scenes with the Portland Hotel Society to pull off this North False Creek swap. In exchange for these two sites, the City will waive the 20% social housing requirement on 4 properties in North East False Creek, where Concord plans to build condominium towers. The two sites on Hastings are estimated to be valued at $13M. It is not yet clear how much money the social housing exemption on North False Creek is worth to Concord Pacific, although it is likely greater than the value of the two sites. If the sites are transferred to the City, it would mean no social housing in the North-East False Creek neighbourhood of Yaletown, continuing the trend of “self-segregation” by the moneyed classes. The NPA are complaining, saying that social housing should be spread around the city, which is ironic given that NPA-linked architect Michael Geller proposed eliminating social housing from the Olympic Village, an action that sparked significant controversy. Vision-led city council cut the social housing at the Olympic Village last April by 50%. Community resistance has been building against the City’s upcoming Downtown Eastside condo tower plan (“Height Review”), which proposes 7 new 15-storey condo towers for the Downtown Eastside. In response to the claim in a City staff report that there was little community opposition to the condo plan, a press conference was held yesterday, Jan 17 by a coalition of Downtown Eastside organizations opposed to the condo plan — including Chinese, Aboriginal, and low-income residents groups, as well as small businesses and artist collectives. Council is planning to vote on the condo plan this Thursday, and will no doubt hear from dozens if not hundreds of speakers. The city has confirmed that public consultations will be held before any individual projects are accepted. However, as opposition to the gentrification plan seems to be falling on deaf ears, residents are worried that future consultations will have the same result. The Vancouver Art Gallery is looking for a new home. The Art Gallery has been campaigning to move since last May. The current building was not designed to be an art gallery and, as a result, there are both spacial and environmental concerns. Council is set to approve a proposal to hold onto the Gallery’s preferred new site, directly east of the Queen Elizabeth Theatre. The policy report also proposes a closer relationship between City staff and the Gallery. The location is notable historically as being the site of riots and labour protests. While it is now a parking lot, and was also once a greyhound bus depot, it was in the past known as “Larwill Park” and acted as a place for meetings and demonstrations, serving a function similar to the current Robson Street public square. Posted in City Hall, Downtown Eastside, Gentrification, History, Homelessness, Housing, News. Bookmark the permalink.